This report is available for download at the bottom of this page. The National Retail Federation’s (NRF) Big Show & EXPO wrapped up earlier this month, with over 37,000 attendees leaving the Javits Centre in New York fresh with inspiration. From numerous aisles showcasing the latest retail innovations and technologies, to hours of strategy discussions and retailer case studies – attendees had lots to digest. 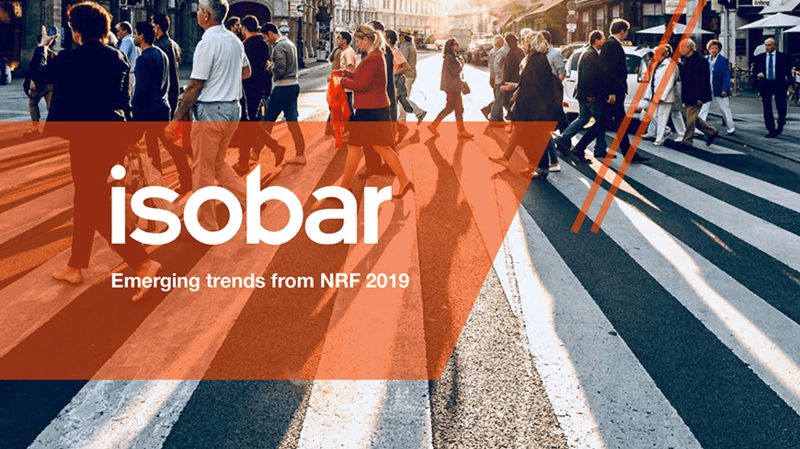 Our ‘NRF 2019: Five key takeaways’ report examines the key trends for brands and retailers from the show. The underlying theme throughout the event was the affirmation that retail is here to stay – specifically the physical store. The idea that online shopping will be replacing the physical store is no longer an excuse brands can hide behind. A balance of both online and offline initiatives will prove valuable. However, brick and mortar stores must become smarter, more customisable and interactive – delivering an experience solely centred around the consumer. Download the report below now, or contact us on HelloIsobarUK@isobar.com.